I was looking for a birthday present, when I found a pile of little red boxes on the ‘games’ table of the shop. 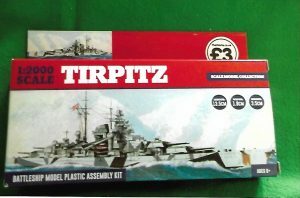 There were four of them, World War II battleships labelled as ‘Hood,’ Tirpitz,’ ‘New Jersey,’ and ‘Missouri’ (these two possibly identical models? 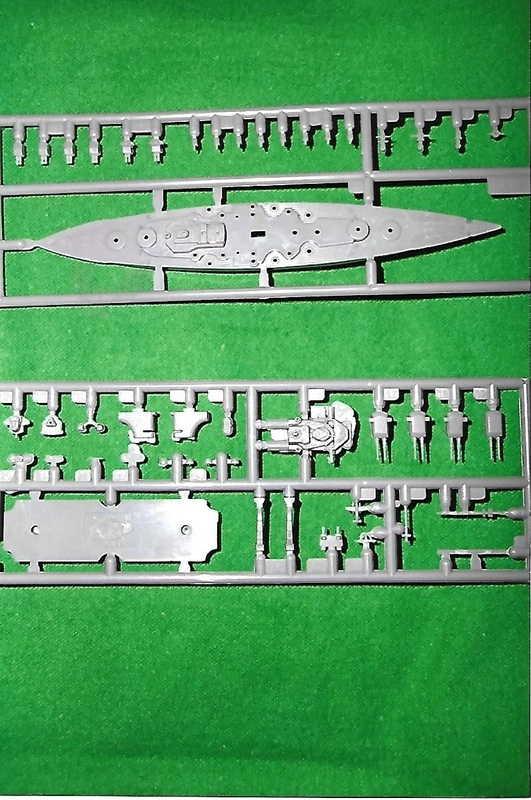 ), priced at £3 for a 1/2000th scale, full hull and waterline models. The boxes, shown in the first photo, are small and easily overlooked. Unusual, to say the least. The scale isn’t one I’ve ever used apart from a few now very old Knight Designs’ Armada-period warships. Anyway, I decided to buy one of them and chose Tirpitz. Assembled, it’s about 13 centimeters long, and the hull is good, no warping. The plastic is hard and grey, so my initial doubts were being settled. This is a very basic package. The instructions on the back of the box are small and hard to see clearly, and there are no other instructions. 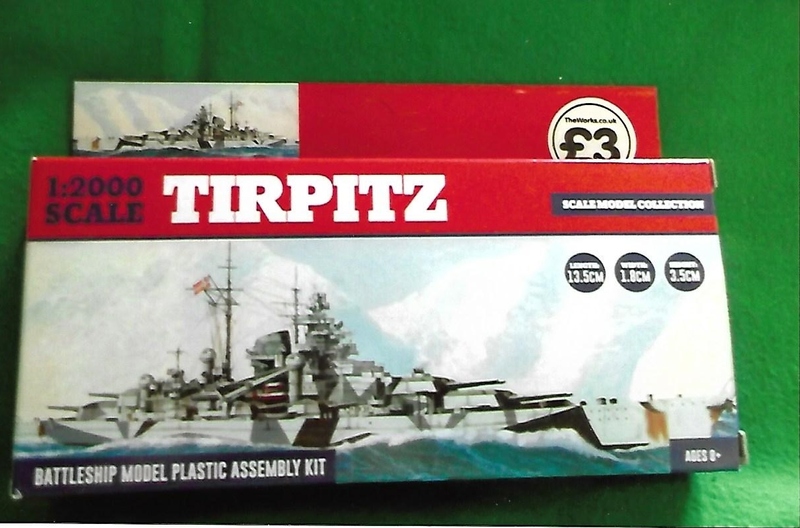 To assemble the Tirpitz is no easy matter. There are more than 30 pieces in all, and attached to sprues, so cutting them away is a task for the steady handed. 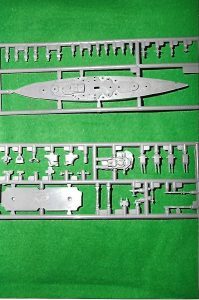 The secondary turrets, director and seaplane in particular require skill just to separate from the sprue. As you can see in the second photo, these are very small parts. The kits are of Chinese origin, and directly imported by The Works, but at the price and given their complexity, I can’t see them selling in quantity. So keep an eye open for discounts in the not too far distant future! It crossed my mind that they might have appeared under another label in the past. I’m going to turn my model into a science fiction warship, and use the small turrets, etc. on 1/1200th scale models. However, I don’t doubt that there’s someone who knows of a decent range of WWII models into which these may fit. Possibly, they might slip into one of the smaller 1/2400th ranges. Will the company expand from these four capital ships? A carrier or two might add some value to them, but these, as a group, are as diverse as the old Pyros were 30-odd years back. Not enough for a game, or a collection.